Tuesday was dirt demo day. 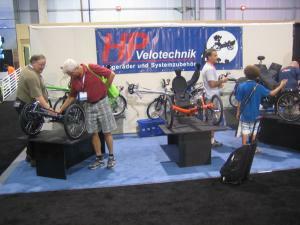 Since I was here last in 2004, this part of Interbike has grown considerably. 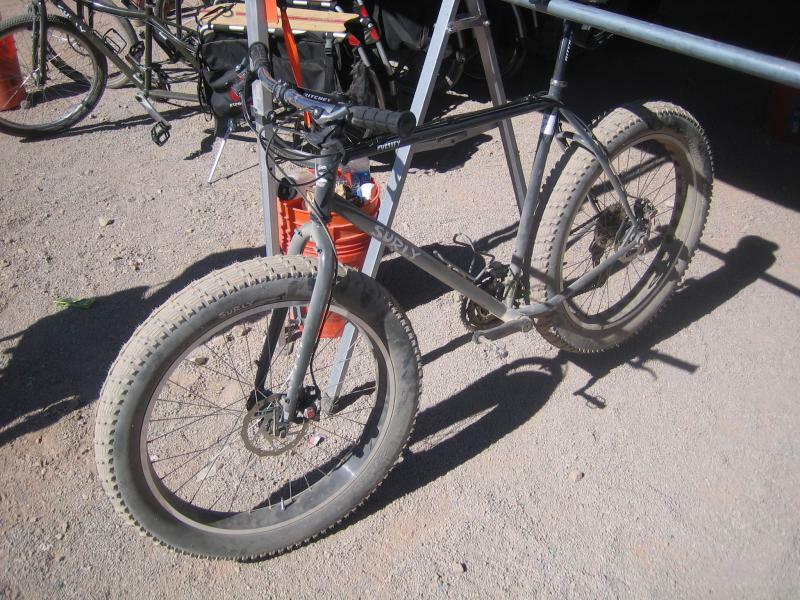 There were possibly thousands of mountain bikes on the scruffy side of an arid mountainside on the outskirts of Boulder, Nevada. 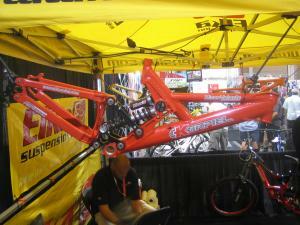 The trend in mountain bikes seems to be "bigger is better". This Surly is a good example. Yes folks, those are 4" wide tires. 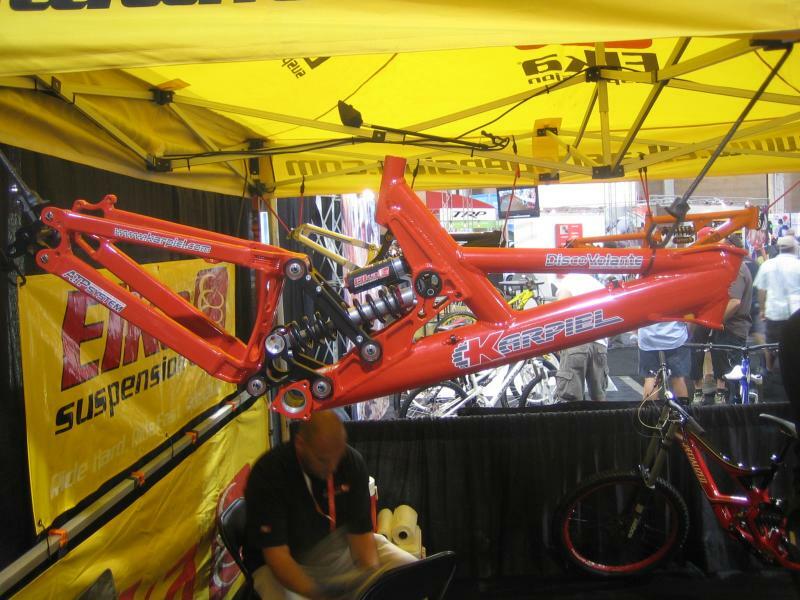 Many of the MTBs were so beefy they looked like dirt bike motorcycles without the motors. 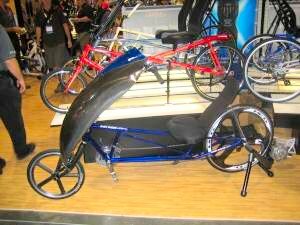 The one recumbent manufacturer that dared to go where no others tread was Sun. They displayed their Taiwan built Easy Racer, which looked very similar to the USA built model, except for the seat. 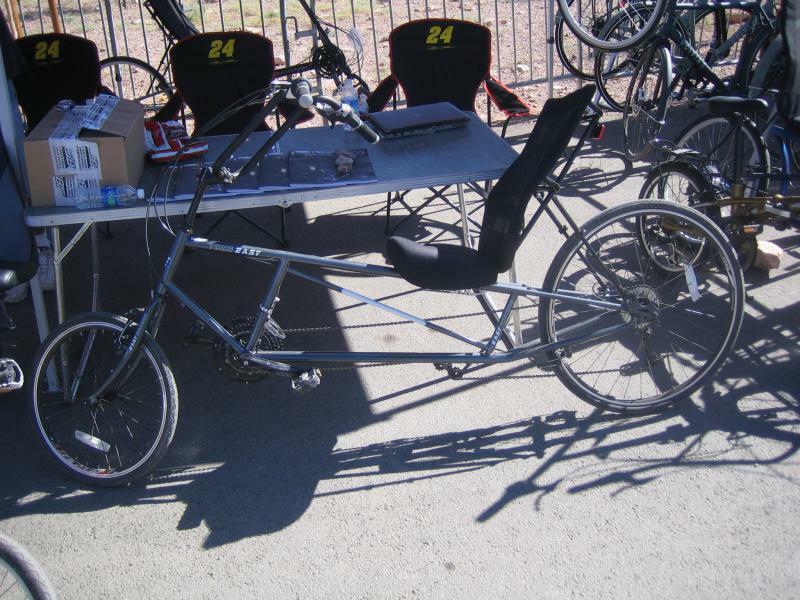 The other recumbent that Sun was displaying was this monstrosity, with a plastic bucket seat "designed by a Chiropractor". 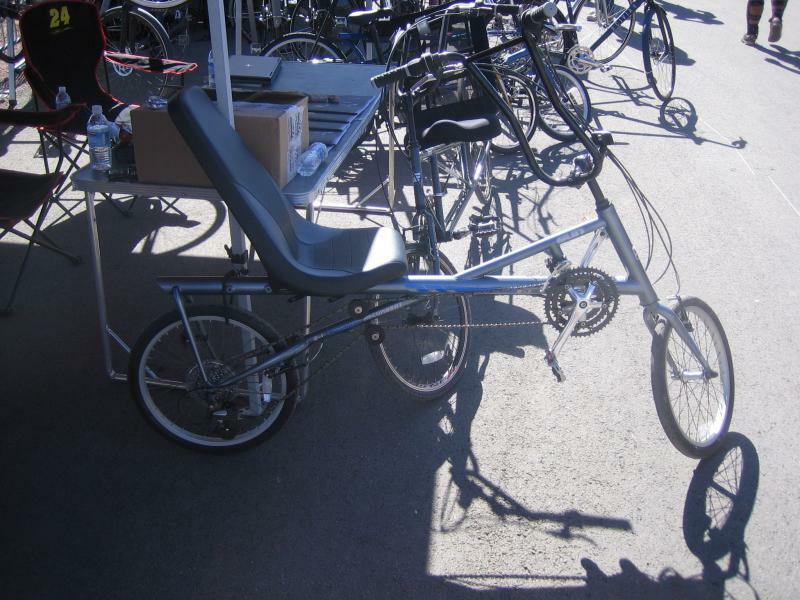 There were a few electric assist bikes on display as well, including this e-zip model with a battery integrated into the downtube and a small Currie hub motor. 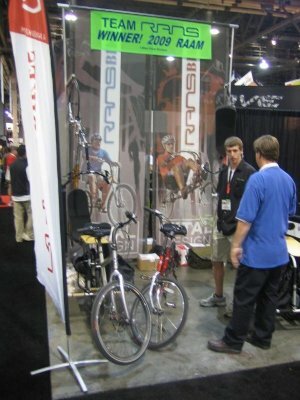 Indoor Interbike start's tomorrow, Stay tuned! Wednesday was inside the Sands convention center. 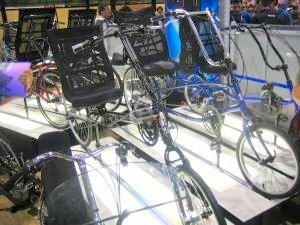 Most of the show was filled with mountain bikes, but this year there were also a huge number of electric bikes at the show. Only a few recumbent manufacturers had booths. 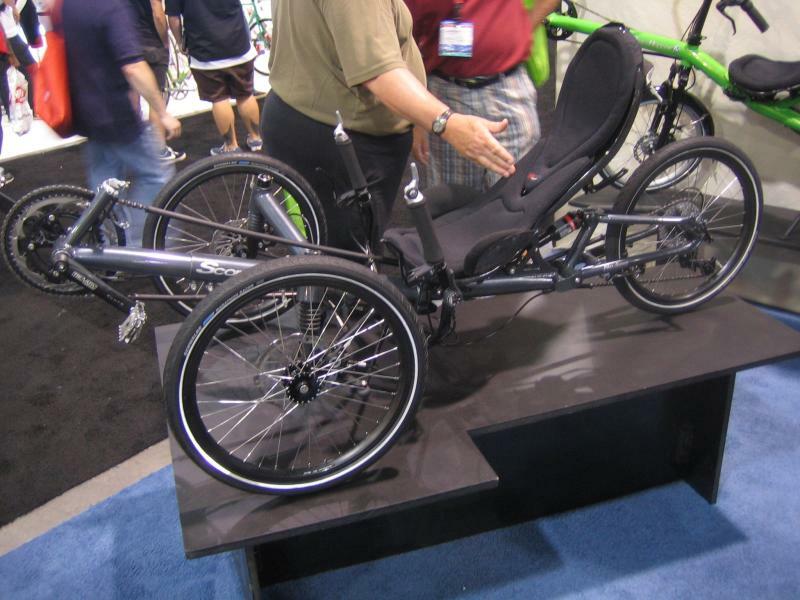 I think recumbent manufacturers have seen that the Interbike show is very expensive and doesn't do much for their sales. Most of the recumbent sales these days come through the Internet in some way shape or form. 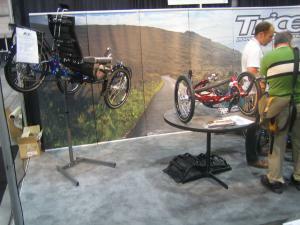 Trice brought some pretty trikes to the show. 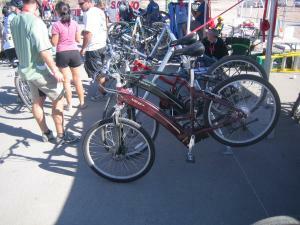 They were all rear suspended folding models. The Trice guys were very busy and I didn't get a chance to ask questions. Here's the back half of one of the trikes showing the rear suspension and coupler. 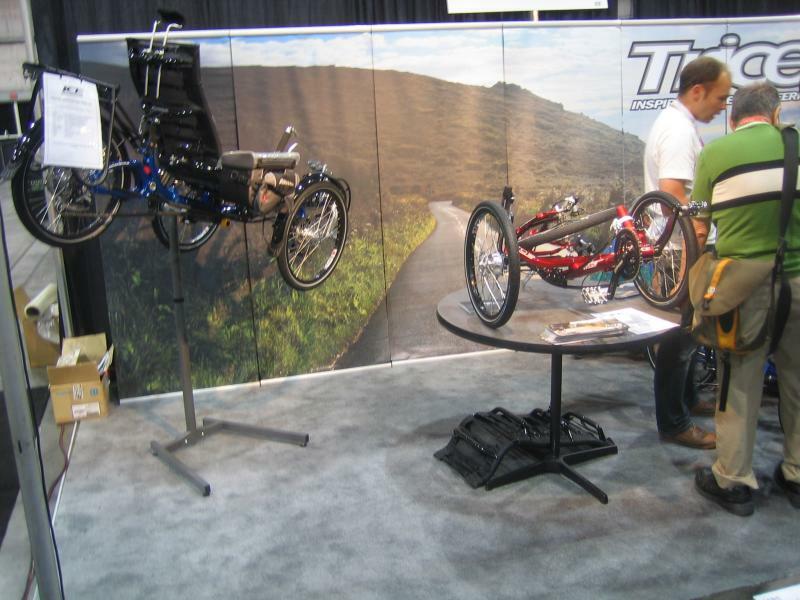 They had a trike folded on the table to show how small it was. It's not as complex to fold as it looks. 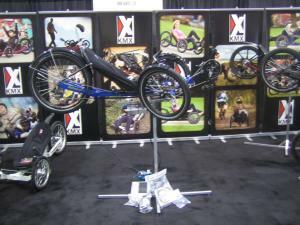 Next to Trice was KMX Karts. The dichotomy was interesting. Both trikes are made in the UK, but have very different target markets. 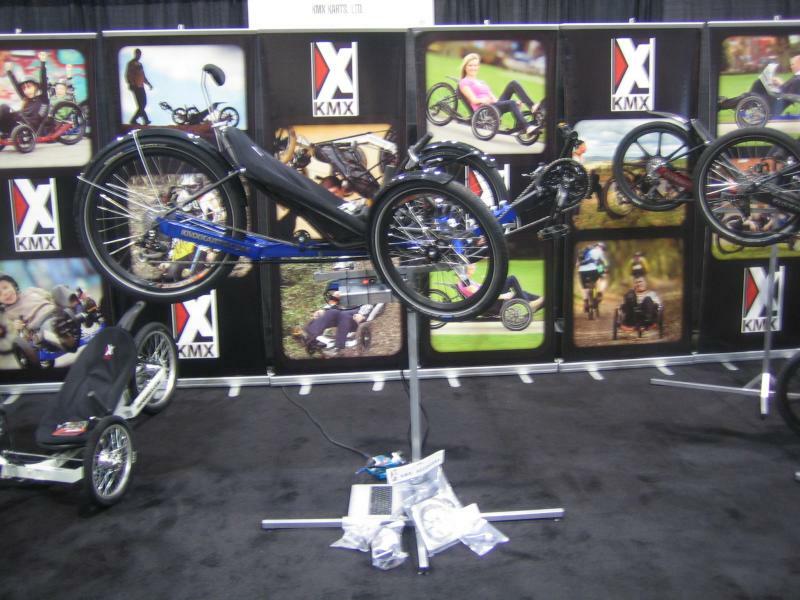 The KMX trikes are super rugged, heavy, industrial, and inexpensive, while the Trice trikes are very elegant and light, but a lot more expensive..
Rans had a tiny booth with an Enduro and an Xstream on the wall, and a crank forward an d hauler on the floor. The sales guy was "new", so could not provide me with much information. DaVinci has some interesting products. Their cranks are works of art. 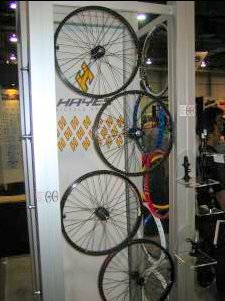 They also have a very cool crossover drivetrain that they use to provide their tandems with independent pedaling and a wide gear range. 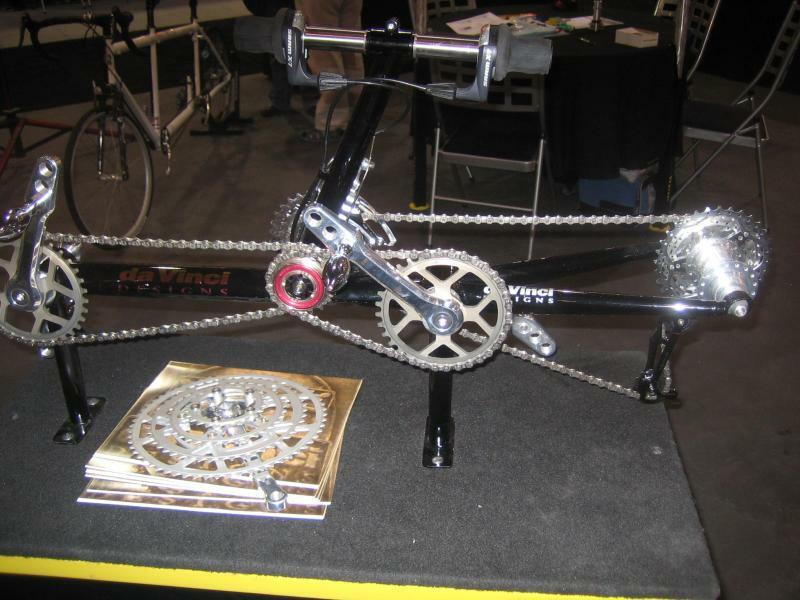 I think they would be perfect for a speedbike drivetrain. 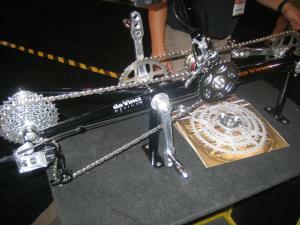 DaVinci owner and designer, Todd said that they would sell them separately. 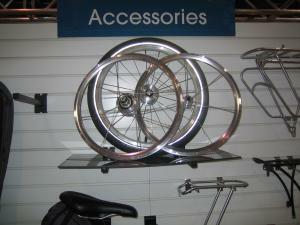 Dahon had a lot of products that would work nicely on recumbents. 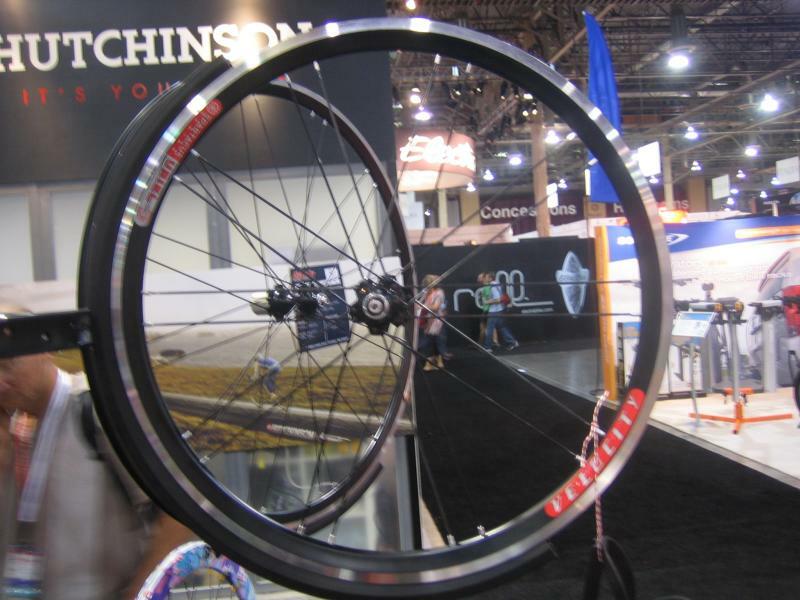 These 406mm wheels would be perfect for a light weight dual 406mm recumbent. 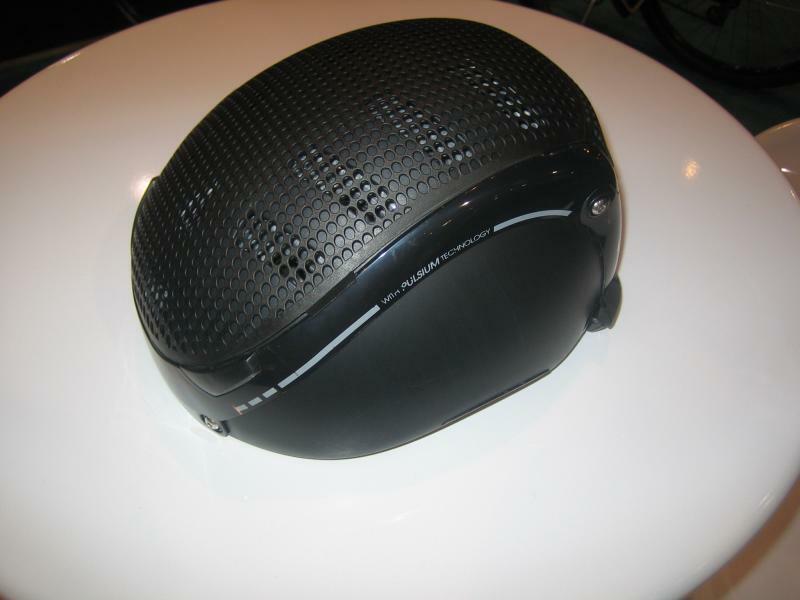 Dahon also had this new folding helmet. The sides slide into the top, and the back folds in. Folded, it was very small. Unfolded it looked like a normal low profile helmet. The picture does not do it justice, it ctually looks pretty good. It retails for a bit more that $100. 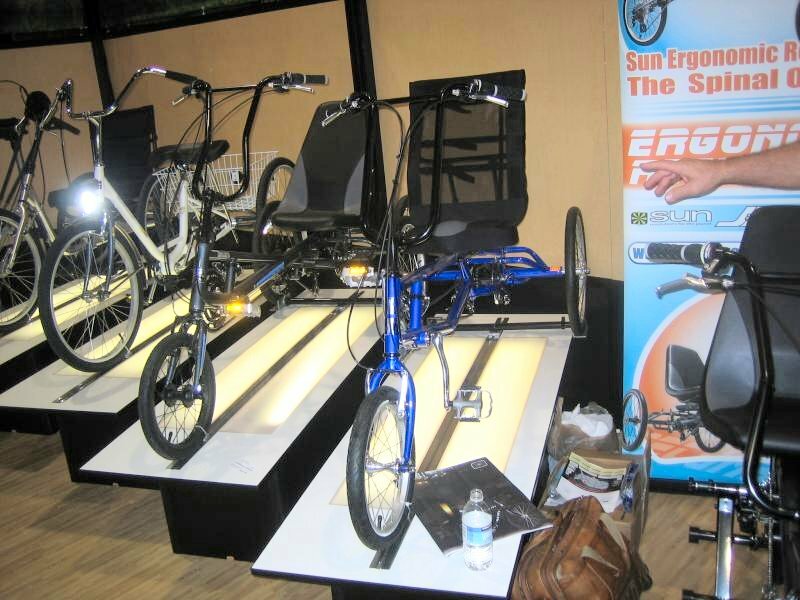 J&B distributors had a large booth that displayed Sun and Easy Racers recumbents. 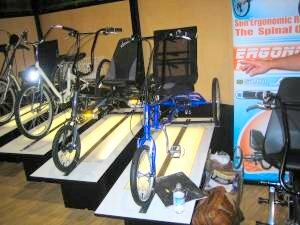 Here's the EZ3 and a new Sun trike with the "Ergonomic" seat. A nice looking Tour Easy "HPV", with a CF windscreen. I think this is the made in USA model. Here's a closeup of a new SWB recumbent that Denton of Easy Racers has developed. 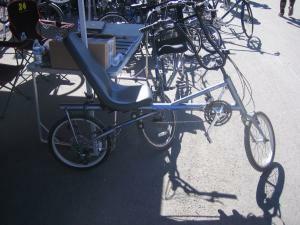 It's all chrome, looks nice, and reportedly handles well and has nothing in common with the ill fated Sun Speedster SWB. 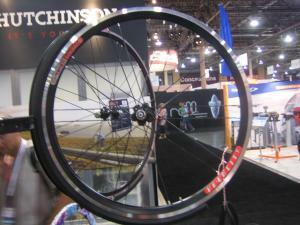 Here's the Taiwan manufactured Tour Easy, along with the Sport and EZ-1. Also at the show was HP Velotechnik. 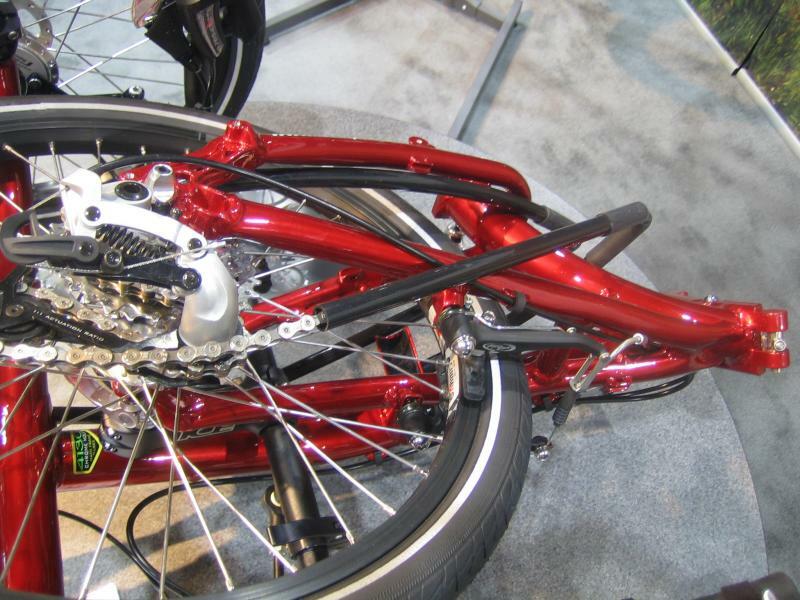 Here's their Scorpion suspended trike. They also displayed their Grasshopper and SpeedMachine models. So, really nothing new recumbent wise at the show. Most evident was the trend toward heavy duty mountain bikes. Here's a good example. 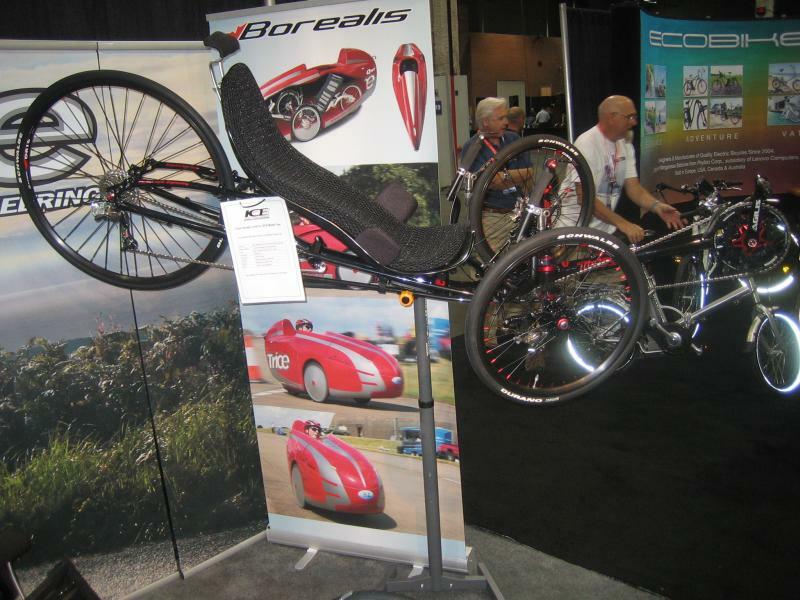 Wednesday night was the recumbent "movers and shakers" dinner, which was a good chance to sit down with the manufacturers, dealers, and other influential individuals to talk bikes. Pinhead Components, a maker of security devices for urban bikes, has a cool set of locking skewers that are very low profile, making them perfect for a recumbent where your feet, legs, or the chain pass close to the front wheel. 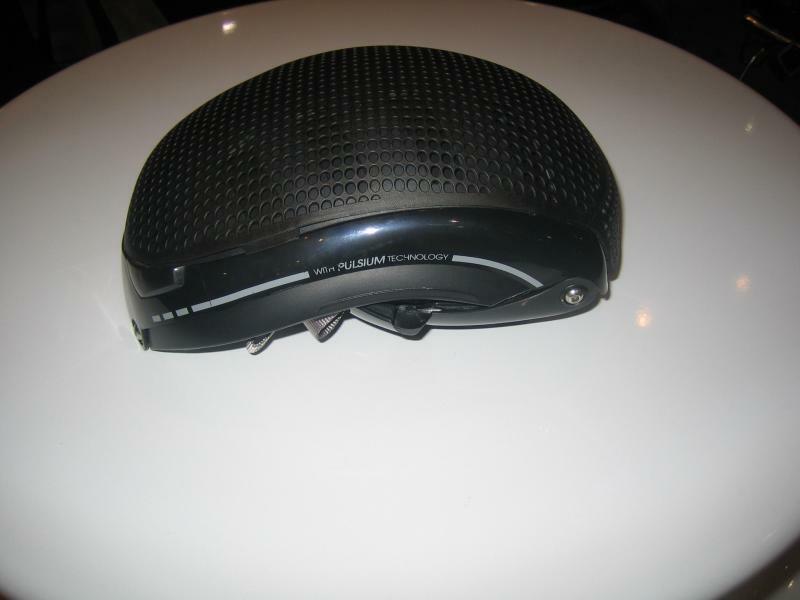 Metrigear is developing a new bicycle power meter that is fitted into Speedplay pedals. 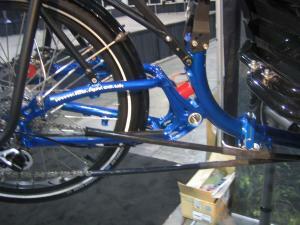 This is cool because each leg is measured separately, and it is easy to move the pedals from one bike to another. It works in conjuction with and ANT+ recording device, like a Garmin GPS to provide wattage output and other info. 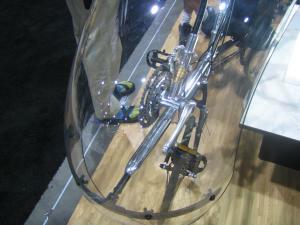 Price point for this unit is under $1000 (Plus Garmin unit), and it should be available first quarter 2010. Reverse Gear, maker of recumbent clothing now has jerseys with zippered side pockets as well as their existing line of front zippered jerseys. BikeGlow makes a cool 10 foot long flexible electroluminescent tube light that wraps around the frame. Enduro bearings makes ceramic cartridge bearings to replace almost any existing bearing. Bike shoe maker Keen footwear will be making an SPD compatible casual shoe that could be worn in a work environment, called "Austin Pedal". These are not currently on their web site but should be available spring 2010. Biomega - cool shaft drive "clean" upright bikes.